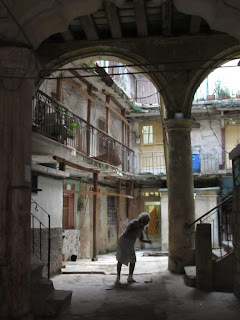 Havana, frozen in time, with old landmark buildings that defined in the 40's and 50 city looks like a lady blush fills in the face for good presence to tourists but can not hide the aging of the rest the body that is where the real people live. But those tourists knowing that carmine in the face is not true Havana go to another city, to see how communism has wreaked havoc on her skeletal arms and her famished legs: the last haven of Castro communism in the Western Hemisphere with no mention deteriorated neighborhoods of Old Havana and Centro Habana are feet full keys and bunion and where a world of poor people crowd. That tourists want to see pictures of East Berlin immediately after the fall of the wall. But that smell of burning oil that gets through my nostrils in Centro Habana is a scent that defines me to Havana and I miss here in Uruguay. Meanwhile Havana waits patiently the great change that is just around the corner. People are full of hope to die Castro and decide the future but do so in silence, in his heart, as any reporter say they are happy there. They have learned to keep quiet. Communism is the art of putting a gag and introduce a policeman inside every Cuban, except a few brave who dare to challenge the new Gestapo. Meanwhile Havana waits in silence. A beautiful in its surroundings with its beautiful beaches and people learned that Contex Fashion and Cubamoda are not dictate the wardrobe couture shops but Miami city. It seems a small Miami parading with its usual garb. The village has become consumer goods from the brutal North and and the government can not do anything. I hope to live long enough to visit a free Havana that every time I see closer. Not to take Daiquiri in Floridita but to walk between its old walls and touch them as caresses a former lover.